One of the unlikeliest complexes of enclaves and exclaves in the world is to be found on the Belgian-Dutch border, and is centred on Baarle. 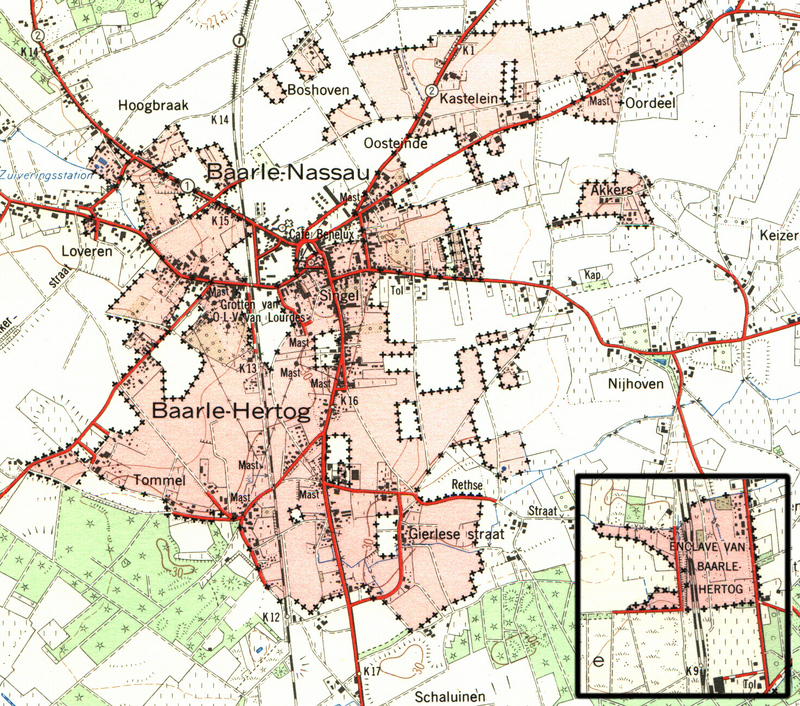 This town, while surrounded entirely by Dutch territory, consists of two separate administrative units, one of which is the Dutch commune of Baarle-Nassau, the other being the Belgian commune of Baarle-Hertog.For an exhaustive history, please visit this page of the Buffalo Ontology Site. The Belgian-Dutch border was established in the Maastricht Treaty of 1843, which mostly confirmed boundaries which were a few centuries old (as the separation of Belgium and the Netherlands has its origin in the religious wars of the 16th century). In the area around Baarle, it proved impossible to reach a definitive agreement. Instead, both governments opted to allocate nationality separately to each of the 5.732 parcels of land in the 50 km between border posts 214 and 215. Numerous attempts have been made throughout the centuries to (literally) rectify the situation, but they have obviously all failed – leaving the double entity of Baarle-Nassau/Baarle-Hertog with some absurd folklore. As each house is deemed to pay taxes in the country where its front door is located, it is an old tradition in Baarle to move the front door some meters if that is profitable for the taxes, especially for shops. The village Baarle attracts a lot of tourists. To make the enclaves visible for the visitor, the little plates with the house numbers are made to look different: ovals with the Belgian colours and rectangles with Dutch colours. This map taken from this page of previously mentioned website. Belgian territory marked red. Dutch territory is white.